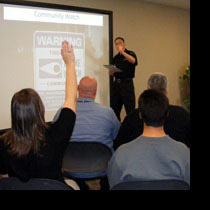 Since ESI Security Services is locally owned and operated, we can assist with establishing a community safety education program. Regular meetings will be held to promote safety and cohesion. The meetings can be held on location or you may use our state of the art community education center at ESI headquarters. A representative from ESI will be at the meetings and will present to the attendees. Topics can include women's safety, who to contact when a safety issues arise, and resident security concerns. We will provide guest speakers which will include law enforcement officers, alarm companies, and many other individuals to help promote safety. ESI will help establish a community watch committee and work closely with the committee to further promote safety. Use of the community education center and our services for the community safety and education program are included as part of our services. :: Request a service propsal by clicking here. (PDF 223 KB). :: Adobe Reader is required to open this file. Please click here for a free download.